The Adriatic was the sixth steamship built for the new White Star Line’s trans-Atlantic fleet. What was considered state-of-the-art in 1871 for passenger ships would seem harsh by contemporary standards. The hull, framework, masts, yards, and even the decks, except for the floors and furniture, were all made of iron. The hull of the 452-foot-long Adriatic was given additional strength with six iron bulkheads that reached from the keel to the main deck, dividing the ship into seven compartments. It had four masts, with the iron mainmast towering at 150 feet. The iron yards and crosstrees were so heavy they had to be controlled by steam-powered winches. Six other steam winches were used for lifting cargo, setting sail and other operations of the ship. The ship had one funnel. Its hull was painted black, thus giving it an imposing profile. The ship’s wheel was set amidships, with all of the steering gear also operated by steam power. In case of accident and/or failure of the steam engines, a second and manually-operated steering set-up was fitted at the stern. Also a telegraph system was installed between the stern and the bridge to allow for communication if the stern wheel had to be used. The engine room, located amidships right under the wheel house, contained four compound engines. They were powered by steam from 24 furnaces and four massive steam cylinders. The ship’s single screw boasted a circumference of over 66 feet. It was the largest propeller screw on any ship in the merchant service at the time. A vast iron hurricane deck was built over the forepart of the ship to protect the main deck from heavy seas. It also added to the overall strength of the hull. Two promenades extended from the hurricane deck to the tern along each side. A portion of the promenades were sheltered from rain by a lateral extension of the upper deck. Over the saloon were water tanks, from which plumbing was installed for each of the cabins, thus providing running water for the passengers. Fresh air ventilators were installed throughout the ship thus assuring passengers of fresh air. The furnishings were elaborate. The vessel offered accommodations for 1,150 passengers, 150 in the saloon and 1,000 in steerage. The builders even attempted to furnish gas-fired lighting throughout the ship and fitted the vessel with some 300 gas lamps instead of the usual candles and oil lamps. But there were so many leaks in the gas lines caused by vibrations in the ship, the gas lamps were never used. As the Adriatic was the largest ship in the fleet she thus became the line’s flagship until the Britannic was launched in 1874. 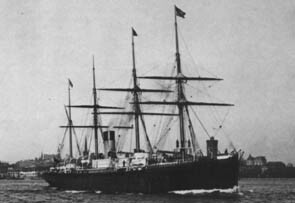 The ship also proved to be faster than the Cunard Line’s best liner at that time, the Scotia, and thus she claimed the coveted Blue Ribald for setting new records in crossing the Atlantic from Liverpool to New York. The ship, under the command of Sir Digby Murray, left on its maiden voyage on April 11, 1872. She maintained that route, making regular trips until the vessel was retired in 1897 and scrapped two years later. The Adriatic went through a major refitting in 1884 that included adding accommodations for 50 second class passengers. During those years, the Adriatic was involved in four major collisions with other ships. This first occurred in October, 1874 while steaming parallel with the Cunard steamship Parthia. The two ships got too close and somehow struck side-to-side, although damage was relatively light. In March, 1875, the Adriatic rammed the American ship Columbus in New York harbor, and the Columbus was sunk. In December that same year, the Adriatic ran down and sank the sailing ship Harvest Queen in St. Georges Channel. The wooden vessel was literally crushed under the steel hull of the heavy Adriatic and the accident killed its entire crew. The Harvest Queen sank so fast that the crew of the Adriatic could not identify what boat they had hit. The victim was identified later when this ship went missing. On July 19, 1878, the Adriatic collided with the brig G. A. Pike off South Wales, killing five crew members on the Pike. This time there was a board of inquiry and the officers of the Adriatic were blamed for running at excessive speed.